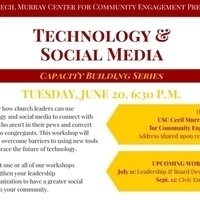 At our June 20 workshop, discover how church leaders can use technology and social media to connect and build community with people who aren’t in their pews on Sunday morning. What are people who visit congregations online are looking for? How can you convert them into congregants? This workshop will help you overcome barriers to using new tools and embrace the future of technology for churches. For more information or to register, contact: Rev. Najuma Smith-Pollard by email at damalism@usc.edu with your name, organization and phone number.